Cauliflower rice is a wonderful substitute for rice that’s perfect for keto and low carb diets, or just trying to eat healthier. 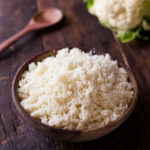 We walk you through how to make cauliflower rice along with instructions for freezing it, and cooking on the stove, and in the oven or microwave. For a long time, there was no such thing as a “cauliflower rice” recipe. We all just had big chunks of cauliflower alongside broccoli in our veggie trays or frozen veggie mixes. 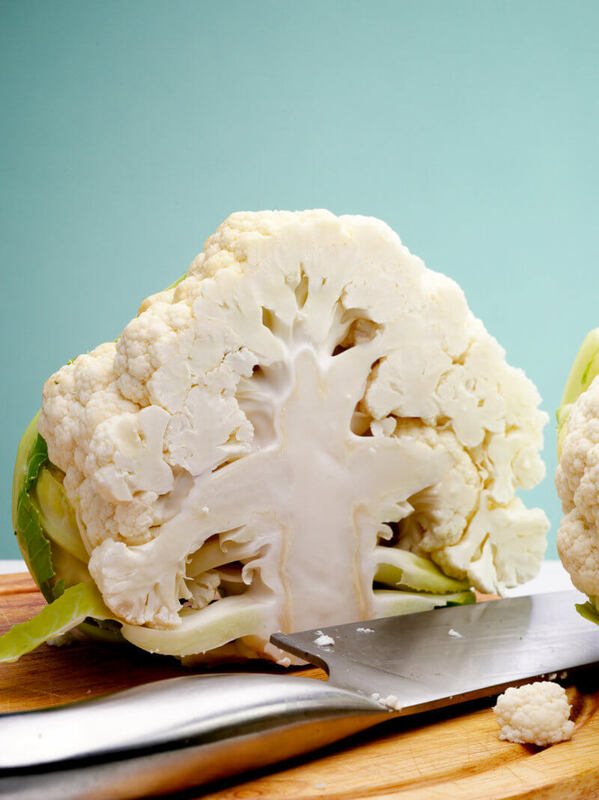 And somewhere along the way, people started to really look at cauliflower, for more than just its unique white color. Turns out, even though we tend to think green = health, cauliflower too offers all kinds of health benefits. 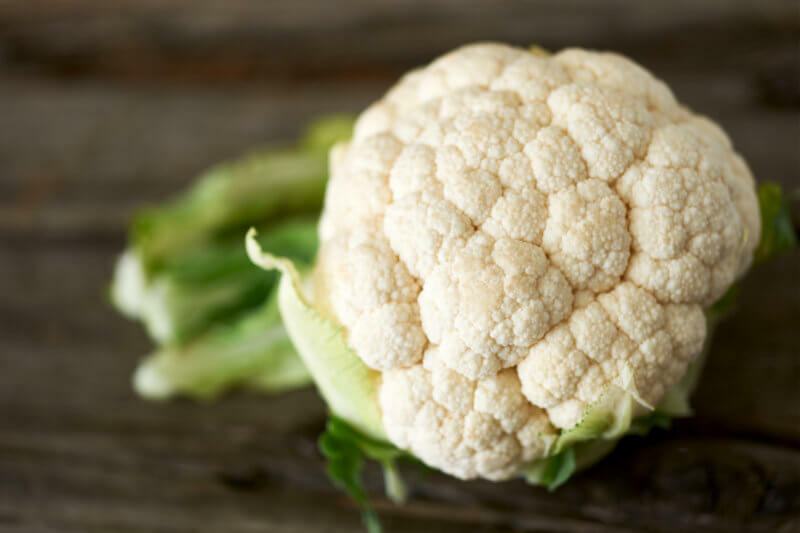 From reducing cancer risks, decreasing inflammation, boosting weight loss, and balancing out hormones, cauliflower does it all. However, if you want to get cauliflower out of the veggie tray and back on the table in new and inventive ways, riced cauliflower is the way to go. If you aren’t familiar, you’re probably asking, what is cauliflower rice? You may remember a few years ago, mashed cauliflower was all the rage. People were cooking up and mashing up their cauliflower in hopes of tricking their children or their carb-loving selves to embrace a healthier potato alternative. 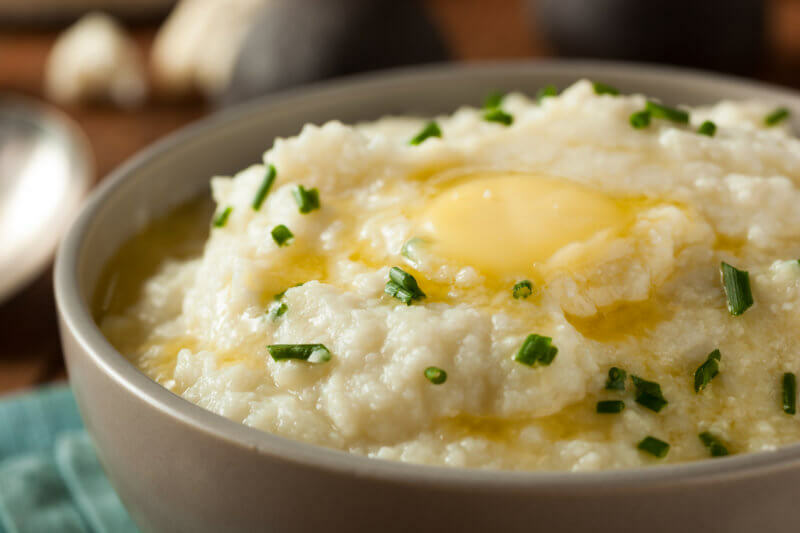 Cauliflower mash is delicious, and actually a really great substitute for mashed potatoes! Sweet potatoes were another popular substitute in recipes like sweet potato hash. Now with the potato slain, people have turned to another common carbohydrate – the oh so popular rice. So basically, think cauliflower, which is rather crumbly to begin with, chopped into small, rice-sized pieces. 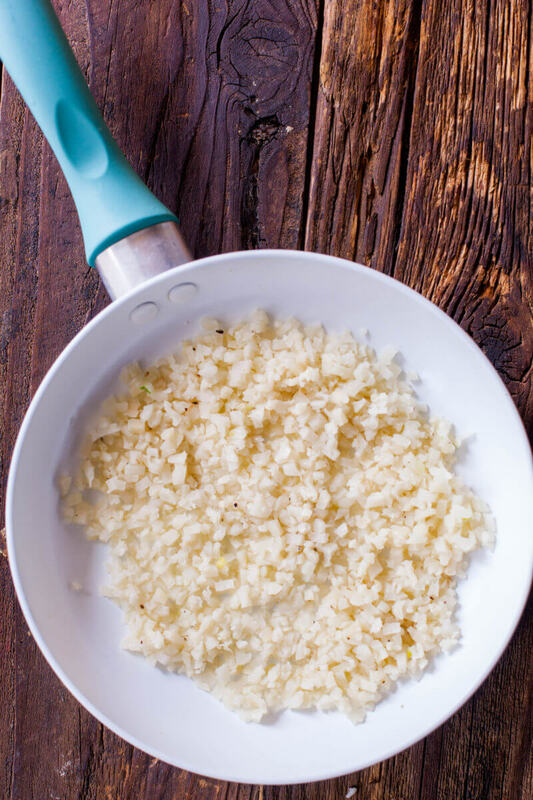 How to make cauliflower rice is a simple and straightforward process. I’m talking, so simple I’m not even sure this is a recipe. However, some guidance on how to properly cut a cauliflower is always important! First, take the head and cut it directly in half, through the stem end (think if you were to cut a brain in half. Ewwww, maybe don’t think that after all.). Then take each half and cut them in half again the same way, leaving you with quarters. If you’re interested in florets, you can see here how to start trimming them from the stems. However, the beautiful part of cauliflower rice is there is basically no waste. The entire stem and the flower can be chopped and eaten. Either finely chop the cauliflower by hand or cut into chunks that can fit in your food processor. Chop or pulse into a fine, rice-like texture. Hint: You can also grate your cauliflower to get that fine texture you’re looking for! I like to use the small shredding disc on my food processor. Voila! You’ve created cauliflower rice! Either cook immediately (instructions below) or read on for freezing instructions that will ease your weeknight dinner strain. HOW MANY CUPS OF CAULIFLOWER RICE IN A HEAD? A one pound head of cauliflower will give you about 4 cups of cauliflower rice. 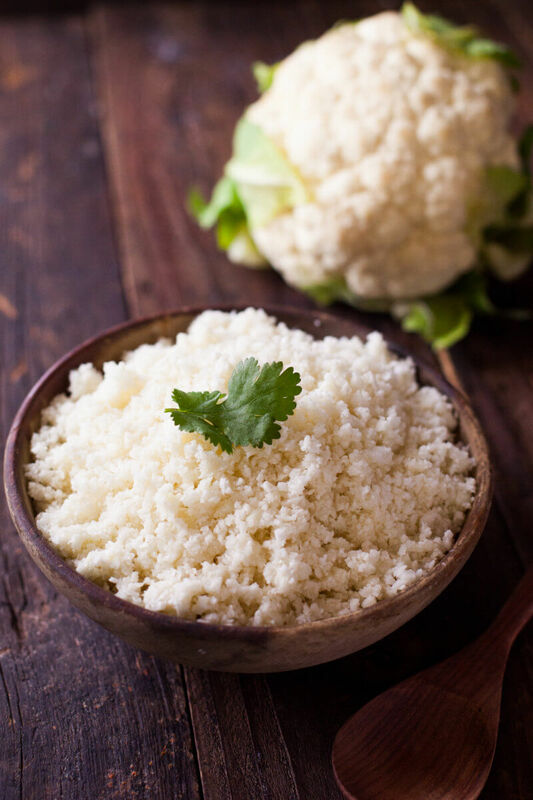 Frozen cauliflower rice is a fantastic ingredient to have on hand any time! When I make an entire head of cauliflower into cauliflower rice, I always have enough for several meals. So, to save all my hard chopping work, I break up the rice into smaller portions – one we’ll eat that night, the others I freeze for later. Make sure you use heavy duty freezer bags, you know the ones that are super hard to open. That means they’ll keep your veggies fresh and freezer-burn free for longer. I usually figure each person in my family will eat ½ cup to a cup of cauliflower rice, so I try to portion it out so I have enough for an entire meal. Before you pop them in the freezer, make sure you get as much air out as you possibly can (this also prevents freezer burn). Then, label them with the date you bagged them so you can use up the older veggies first. Once you have your raw cauliflower rice all prepared, you need to know how to cook cauliflower rice. The best part is you have a lot of great options, and your riced cauliflower can easily be added to just about anything you’re making. You can mix it into salads, casseroles, or soups for added veggies. 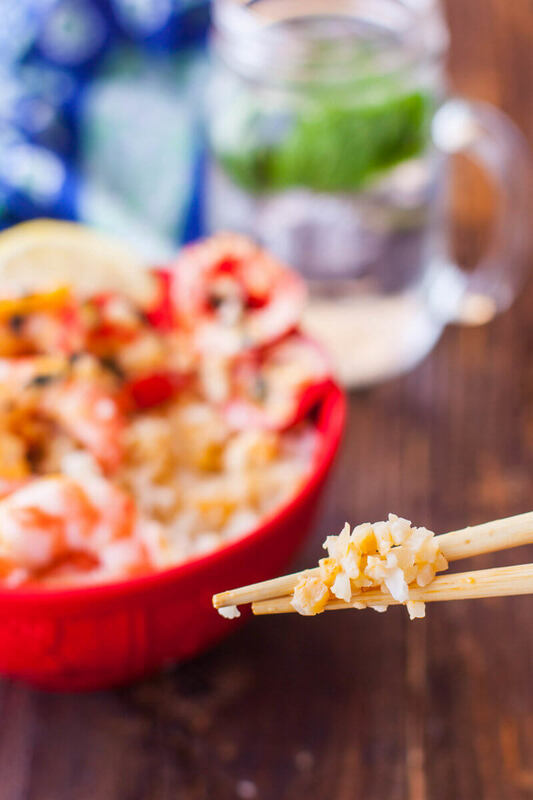 You can also use it in place of rice for your favorite fried rice recipe, as a base for stir fries, bi bim bap, and sushi bowls, or serve it as a side dish on its own! There are three main ways to whip up your cauliflower rice – in the microwave, on the stovetop, or in the oven. When you need a quick side for dinner, you can just pop your riced cauliflower in a microwavable dish with a lid and cover it. Heat for 3 – 4 minutes on high (go with four if your rice is frozen). Season and serve. While the fastest method, it might not be the most flavorful. However, you can jazz it up with spices and flavorings as you like. Add ½ teaspoon of soy sauce or lemon juice before microwaving if you want to add some flavor to your microwaved cauliflower rice. For those of us who try not to use the microwave often (especially with plastic! ), you can also pan-fry cauliflower rice until tender on the stovetop. I use a little bit of olive oil or avocado oil, with the stove on medium high heat. Be sure the oil is hot before you add the cauliflower and cook only for only a couple minutes stirring until it’s just tender. The flavor added by the oil brings the dish to a new level – just be sure not to overcook, or it can get soggy! 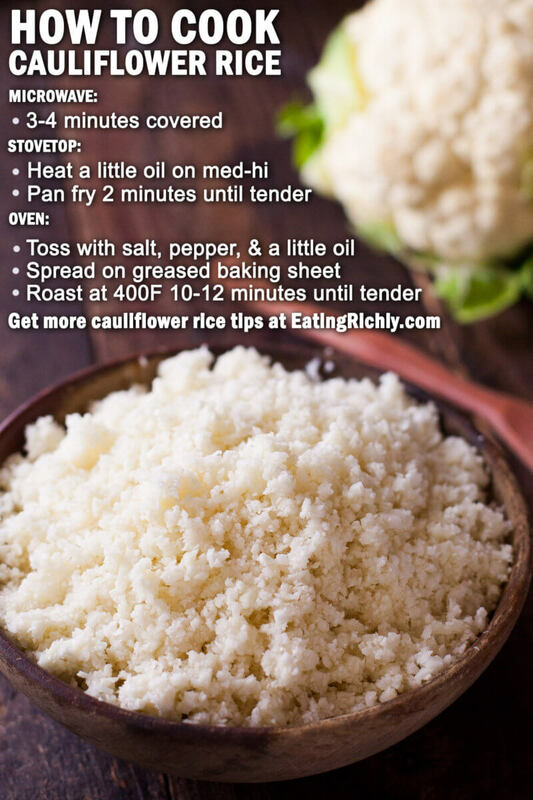 Lastly, you can also roast cauliflower rice in the oven. Season with a bit of salt and pepper, drizzle with oil, and toss well to combine. 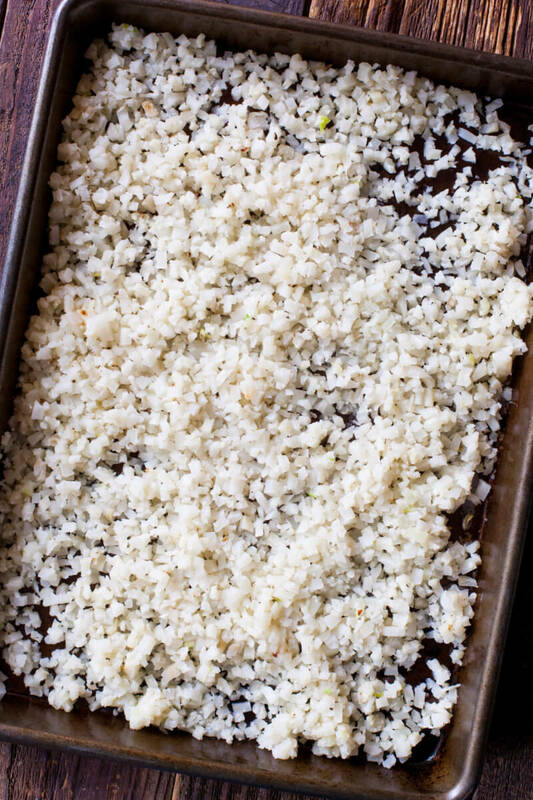 Spread the rice in a thin layer on a greased baking sheet. Cook for 10 – 12 minutes on 400 to get the cauliflower rice tender and bits of it slightly golden. I’m currently having riced cauliflower in a lovely sushi bowl. I used my healthy sushi bowl recipe but subbed the rice and swapped the leftover salmon for some steamed shrimp. Look, you can even eat cauliflower rice with chopsticks!!! It would also be amazing with pomegranate seeds and mint like this pomegranate rice! Here’s a few more ideas for using cauliflower rice from some of my blogging friends. Whether you’re trying to eat low carb or not, make sure you add cauliflower rice to your weekly menu! It’s an easy way to get more veggies in your family, and another step toward healthier eating habits. PIN TO SAVE SO YOU DON’T LOSE IT! 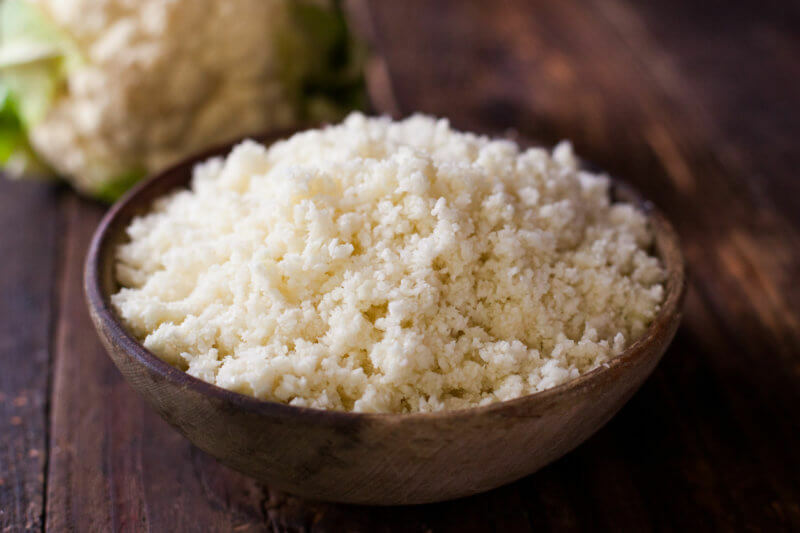 Cauliflower rice is a wonderful substitute for rice that’s perfect for keto and low carb diets, or just trying to eat healthier. Here are the basic instructions for making it at home. Cut the cauliflower in half, then quarters. Chop them into smaller pieces that will fit into the food processor. Pulse about 1/4 of the cauliflower at a time in the food processor until they are rice sized pieces. You can also use the shredding disk on your food processor to do the whole head at once. Keep unused cauliflower rice in the fridge for up to 5 days, or the freezer for up to 6 months. Place in a microwave safe dish with a lid and cook on high for 4 minutes. Season with salt and pepper. Heat a little oil in a skillet on medium heat (medium high is fine too). When oil is hot and shimmering, add the cauliflower rice and stir for a few minutes until tender. 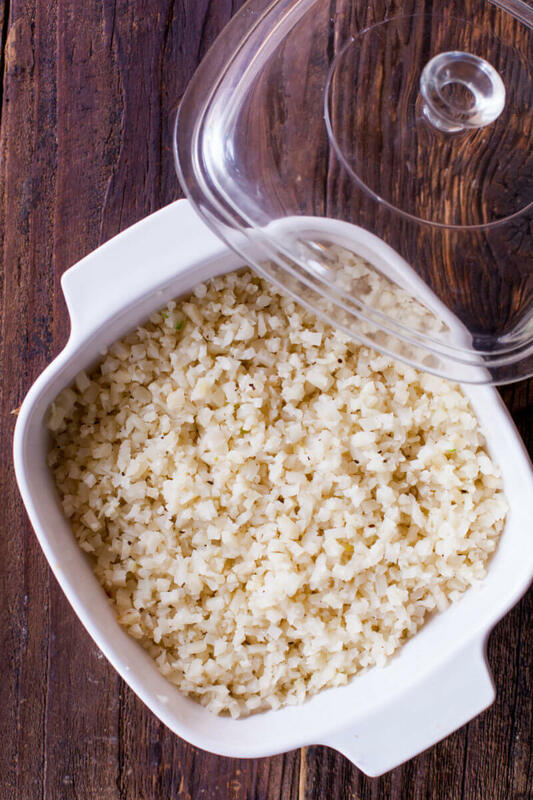 Toss cauliflower rice with a bit of olive oil, salt, and pepper. Spread out on a baking sheet (I spray mine with olive oil spray as well so nothing sticks) and roast for about 10 minutes until rice is tender. This is the best tutorial for cauliflower rice I’ve found! I love that I can make it in the microwave for an easy side dish. Thanks Ashley! So glad you love it! Say YES to cauliflower rice! My husband would hardly know the difference if I hadn’t mad such a big deal over it. I love how easy you make it look to make my own riced cauliflower. I may need to try to make my own instead of buying it already riced next time. It’s just a little more work but can definitely be cheaper! I really prefer the texture of ricing it myself. I love cauliflower rice. My favorite way to make it is in the oven! Thanks for all the tips! 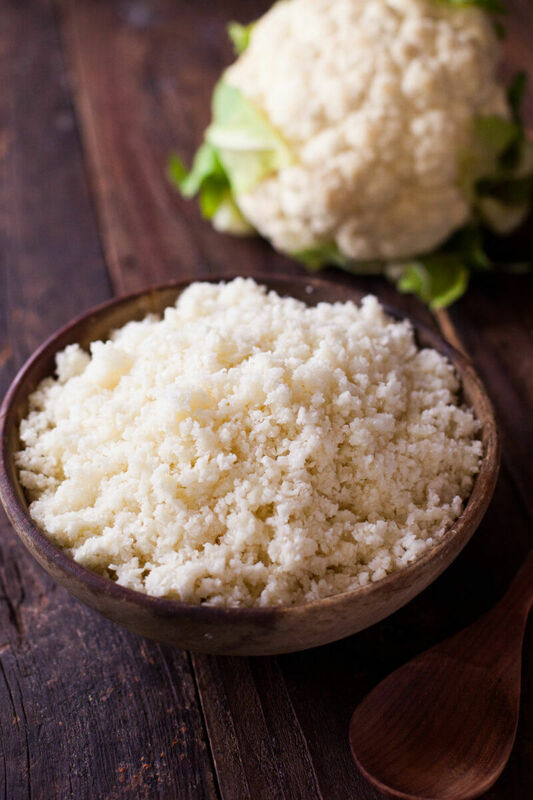 This is seriously the most in depth and best post on cauliflower rice that I have read! Love all the tips and instructions – thank you!! I LOVE cauliflower rice. Your step by step process makes it really easy. This is perfect for tacos! Ooh I hadn’t even thought of using it in tacos Liz! It would be great in a burrito too!